Lisbon was the first and last stop on our five-day road trip and I wrote about it here, with the three days in between spent in the Algarve region along the southern coast. We rented a car in Lisbon and on the way south, stopped in the historic towns of Évora and Beja. Be sure to read Gilly Pickup’s article about the Alentejo region. Portimão acted as our home base, providing a central location from which to explore. When someone repeatedly tells you how beautiful a destination is, I’m not sure if it fully sinks in until you see it with your own eyes. This is how I feel about the Algarve. Words and photos alone do not do the landscape justice. 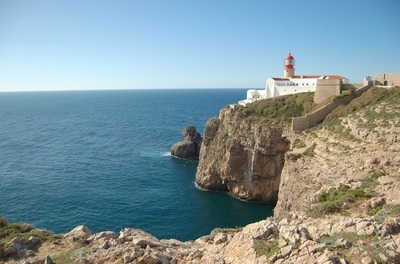 Cabo de São Vicente (Cape St. Vincent) is Europe’s southwestern most point. The red lantern lighthouse provides a stark contrast to the clear blue waters and steep, rocky cliffs below. Supposedly this structure is the most powerful lighthouse in Europe due to its range. Praia da Arrifana, is a popular area for surfers, boasts breathtaking views. The rugged coastline rises up from the water, with the surf crashing onto the big boulders and pristine beach. Monchique, on the other hand, involves a winding trek to the top of the mountain. If it is sunny and clear, the 360-degree panoramic view gives a good lay of the land. Lagos is known for the Ponte de Piedade. First, we witnessed the cliffs by boat, taking a tour with Bom Dia, a company that departs from the marina. As it was low season, we had the boat to ourselves. Our tiny vessel navigated in and out of the coastal coves and caves. Erosion from the powerful seas and currents have carved beautiful formations, and the skilled and knowledgeable captain navigated us through many photo-worthy spots. Following the boat tour, we did a short hike along the shore, appreciating the grandeur from above. We continued our adventure by taking a swim on Camilo beach, walking 224 stairs to reach the sandy beach. Small and cozy, we felt protected, as it had its own little cove inlet. The sunsets burst with colour. Reds, oranges, blues, purples: the medley of hues paint a perfect picture. 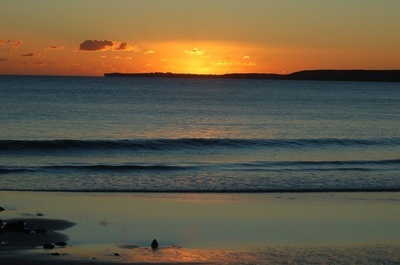 Relax on the beach and chat with good company as you watch the sun go down. Head west for the best view. ​Claire’s, housed on Praia Da Rocha, was a fantastic experience all-around, between delicious food, friendly service, and reasonable prices. We continued our local culinary tour, this time trying swordfish prepared Algarve style, fish cataplana, and a ham dish. The ham was so tender, it fell right off the bone. The owner took care of us, sharing fun anecdotes. He also educated us about Portuguese cuisine and wines, including port and green wine. 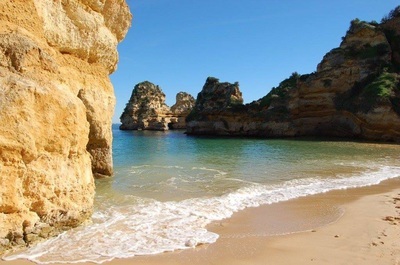 Alvor, nearby, is a quaint fishing village and, naturally, home to fantastic seafood restaurants. We dined at A lota, a modern restaurant near the harbor. The meal started with little bites, but also lobster bisque and – if you can believe it – the largest grilled prawn I’ve ever seen. The main event, however, were the entrees: the snapper, covered and cooked in salt, and dorado. Once again, friendly service. Between our experiences in Lisbon and now down south, I was in foodie heaven. Overall, the entire experience blew us away and exceeded expectations! 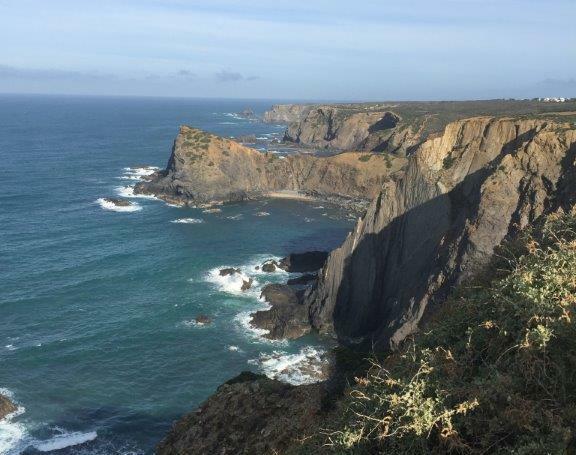 Portugal is a wonderful combination of friendly people, great food and wine, and spectacular scenery. I look forward to returning again one day soon.